Summer is coming to an end, and while we are sad to say goodbye to our shorts and sunhats we are excited for everything that comes with autumn. Pumpkins spice everything, cozy wool sweaters, cider, donuts and so much more. Autumn has become the most popular time of the year to get married. With that in mind we’ve come up with a few trends to keep your wedding autumn appropriate and unique. 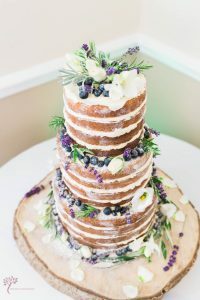 Woodsy themed weddings are still on trend for this coming wedding season which means a ‘naked’ cake is still a popular option. 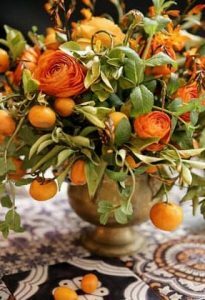 Whether it be a nice citrus or an apple or peach for the season we love the added touch of a fruit mixed in with the standard flowers. It is nice way to keep things unique without going overboard. 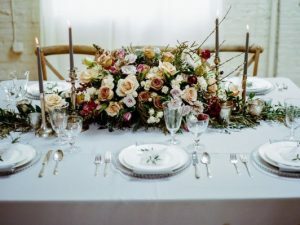 Another way to take something traditional and make it more modern is to involve florals in another way beyond your centerpieces. 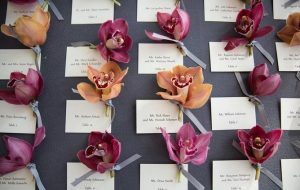 By included a flower with your name tents it allows guests to easily access a flower that they can wear for the remainder of the night. Fairy lights have been popular for the past few years and as their popularity has grown so has other unique lighting options. Edison lights are just one of the many options when it comes to lighting. 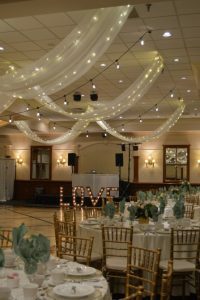 Whether it is plain Edison lights by themselves or if you do them in addition to some draping, they are an easy way to spice up any reception. Mauve and blush have been on trend for the last year but as fall rolls around that trend continues. Whether it’s through linens or florals you likely won’t attend a wedding this year without seeing at least some shade of blush or burgundy. Instead of more tradition options like silver or gold, many couples are opting for something more unique for their metals in their reception room. While photo booths are on their way out taking photos of your friends and family is still important. Trying to find new and exciting ways to capture the night can be difficult. 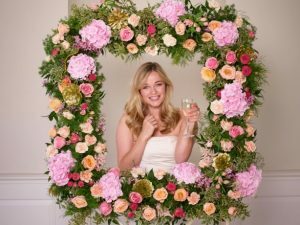 One fun way to do it, without acquiring an additional vendor is a floral frame.